Foreshadowing (also known as “guessing ahead”) is one of the most powerful storytelling tools, but only if used right. The main goal of foreshadowing is to prepare the readers for what comes next. However, this goal can be achieved with the help of different methods, and that’s when the challenge starts. Sometimes writers fail to achieve this goal at all, giving the details of the main secret right away instead of subtly hinting that a certain thing is about to happen. This is the main reason why readers sometimes hate foreshadowing. When it is used in a wrong way, it ruins the whole intrigue of a story instead of making it more interesting to read. However, if you learn how to use foreshadowing right, you’ll be able to write stunning pieces that will easily catch the readers’ attention. To do this, you need to understand when it’s appropriate to use foreshadowing and what things you want to hint. Knowing about the types of foreshadowing can help with that. Dialogue: when reader founds out something with the help of characters’ dialogue. Remember Cloverfield? There was a party at the beginning of the movie and some people joked that they won’t survive the night, referring to heavy drinking. They actually didn’t survive it but due to the monster attack! You can choose any type you like as long as you’re sure that you’ll be able to use it to create a dramatic effect. However, it is important not only to choose the right type but also to know when to use it. It is obvious that foreshadowing has to be used before something happens. However, there’s more to that: you can make it a solid hint of what will happen later (and in this case you need to use it as early in your novel or screenplay as possible). When you choose this kind of foreshadowing, the best way to use it is starting from the first chapter or scenes: place a little hint there, then mention more as the story progresses. What else to you need to remember? Russian writer Anton Chekhov once said that when a gun is introduced in the story, it has to fire later, otherwise, it would be strange to mention it. This rule applies to foreshadowing perfectly: if you have some “guns” (key events, persons or things that are important to the plot), you have to hint at all of them (or at least most of them) in the first half of the novel or screenplay. If you somehow manage to mention them in the first quarter of your novel or screenplay, that would be even better. This is so important because the first quarter of a novel or screenplay is usually all about set up: writer introduces characters along with settings, gives the reader some necessary details. At this point it is easy to use foreshadowing without risk of being too straightforward, as it is mentioned along with many other facts and so won’t strike the eye. What to do if a foreshadowing is less obvious? Light foreshadowing is another thing: it is more subtle and is usually used not as the first hint of something that is about to happen, but more as a reminder of this “something” or of its previous hint. One of the best examples of light foreshadowing appears in the original Star Wars trilogy. Remember that time when Luke Skywalker trains with Yoda to defeat Darth Vader? He battles with his projection and manages to pierce it with his lightsaber only to find out that there’s his own face hidden behind Vader’s mask. What a nice hint at the fact that Darth Vader is actually his father! That’s why it needs to be used later, just before something does happen. This way you’ll be able to remind readers about your previous hints, making them more obvious, and raise their interest in the plot. After all, a little tension is good: it increases anticipation. The only way to make foreshadowing look good is to use it in the right place and write it organically in your novel or screenplay. 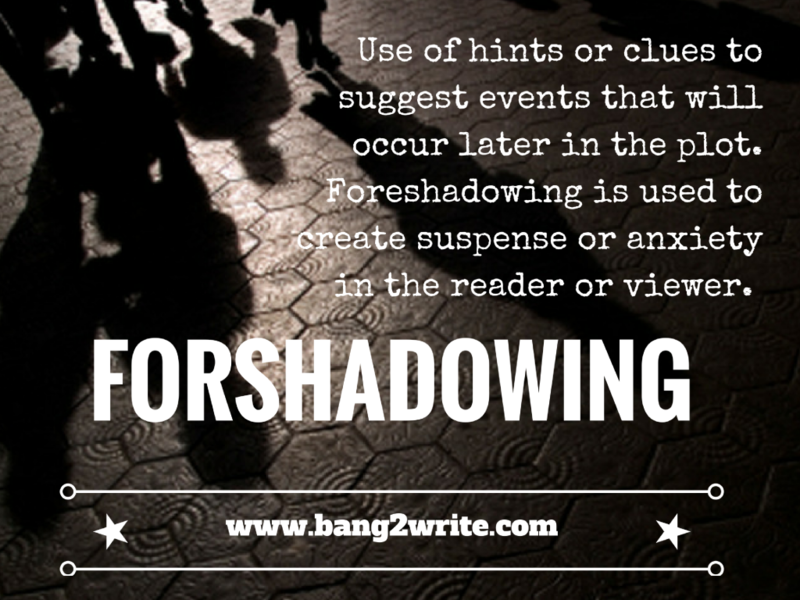 Foreshadowing has to look in place, and to do so you need to have a clear vision of your plot. If you know the whole story structure in details, it would be easy to find a place where foreshadowing will look appropriate and will benefit your story. That’s why if you want to be sure that you’ll use foreshadowing right, take some time to think over your plot and write it down in details if necessary. We hope that our tips will help you to understand foreshadowing better and to use it in the most effective way. We wish you good luck and tons of inspiration! BIO: Alice Jones is a tutor and freelance writer for this blog, who is interested in education, blogging and sharing her ideas. She also loves inspiring and motivating people and has spent the last 5 years improving and helping the others to improve. Follow Alice on Twitter, Google+, or find her in other social media, pop in there and say “Hi” to her!